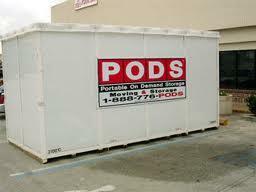 PODS is one of the most well known portable storage unit services around. PODS stands for portable on-demand storage and is one of the original portable storage unit companies. While they are still considered to be a leader in their industry, there are also some potential drawbacks to consider. Everyone has their own unique needs, so it is impossible for one option to the best fit for everyone. Here is a quick PODS review to help you decide whether or not they are right for you. PODS storage containers allow you to replace the need for both storage companies as well as moving companies. You can either use a PODS container for long term storage, which is anything stored longer than one month, or use one instead of renting a moving truck. You are not responsible for any of the transportation as they will pick up and drop off everything for you. There are several sizes of PODS containers available and they range from holding 1-2 rooms to 3-4 rooms-worth of stuff. They are rented out on a monthly basis, which means that if you are moving, you don’t have to rush. PODS will also take care of the pickup and delivery of the storage container as well. One of the biggest reasons that people use PODS is that it offers a much easier and more convenient solution than either stand alone storage units or moving services. Not only do you get the storage container dropped off in front of your residence, but they also transport it and remove it for you. If you use them to move, you can stretch the process out over a month rather than a day or two. One of the most stressful parts of moving is trying to complete everything before you have to return the rental truck by giving you a large window to complete everything. If there is one thing that most people hate about moving, it is the stress involved. It seems like a lot needs to be done in such a short amount of time. Along with loading and unloading your rental truck, you also have to pick it up, drop it off, and keep it clean. Plus, if you are not comfortable with driving a large truck, then it can be the most stressful part of it all. In general, there are two potential drawbacks to using PODS containers for moving, storage, or both. The first is that the storage containers can get bent or broken, which can damage your property. This is because they are not made out of steel like some of the other companies in the industry. While this isn’t inherently a problem, it is something to consider. The other potential drawback is that you may get charged additional fees. Keep in mind while that all of their fees are clearly stated, a lot of people simply overlook them and are then surprised by them later. Overall, PODS seems to be well regarded within the industry and is definitely one of the most widely used container companies. They offer a convenient solution that eliminates a lot of the common stressors of moving. At the same time, it is one of the more expensive options on the market. It can be a great solution as long as it can meet your needs. Tip: Be sure to use a PODS promotional code to save 5% off the cost of a Pods storage unit. Reserve your unit at PODS.com. Others have gotten quotes from Pods and say they cost too much. I feel that Pods is excellent company but are perhaps targeting richer clients such as companies that want to remodel their facilities and just put everything in a Pods unit in the parking lot. Military and government customers responding to disasters such as hurricanes are also big on their list. Some say it’s too risky to put your stuff in a Pod and send it cross country, but I dont think so because Pods told me that they use air-ride trailers and have insurance just like any other moving company. People posting online love to post complaints about Pods but my experience with them was great. Yes they charge a bit more than DIY truck rentals etc but they do have a lot of advantages. It’s up to you to decide if the conveniences are worth the money. For me they were. I booked a pods unit on their website from January to April. I went with PODS because of the convenience of it being delivered to my home and being able to load it when I’m ready. Then you call them back and they come and pick it up to store it. My interactions throughout the process were good. I had to call them on the phone a couple of times and their representative was friendly enough. The only issue that I dealt with was the payment process. I initially used one credit card for the first payment, then I wanted to use another one for future payments. So, the creditk card that they had on file was no longer active. Other than that, everything was good throughout the whole process. I rented the largest storage container pods had for all the stuff I needed to store. Pods delivered the unit exactly when they said they would. And whenever I asked them to pick it up, they did that as described also. And when I asked for them to deliver it to my new home, they did it and they picked it up the next day. Everything was right on point in terms of scheduling. On the whole, everything was pretty seamless. I saw a lot of PODS around the neighborhood so I used them for storage services. It was as easy as i thought. The pod got dropped off, I loaded it up, they took it away and theyd store it for a year for me. I booked online and was trying to make sure that the pod would fit in my driveway and was trying to figure where I was going to put it on my property. The website was easy to use. I got a medium-sized container. On the website, they gave an approximation for the size of pods depending on how many bedrooms i have. When it was all said and done, the pod I got has enough space. The gentlemen who dropped off the container were very professional. I was trying to see if the container was going to fit in our driveway or not. They came out and looked at it and said that it was not a problem, and they dropped the pod off. I went to the storage facility where the pods are all stored, and they had it set up for me and ready to go. It was timely. I rented two 16’ pods containers and had them delivered to our driveway. I measured the width of the containers and they were 7 ft 9 inches wide. But the website said the containers have an external dimension of 8 ft in width, which would have been wide to fit my hot tub. I had to cancel the order and get them to pick up the empty containers the very next day, because we could not fit our hot tub in either of them. Very disappointing and frustrating to have something so simple go so wrong! I used a pods unit to store my belongings while staging my home for sale. After our home sold we used pods to move our stuff from Texas to Utah. But they didn’t deliver our unit when they said they would. We called to ask where the pods was and they said it was still in Texas! We had to stay in a hotel, had trouble transferring money to them, ended up being a disaster. Very frustrated with this company.